Thousands of Brits head off abroad every December to places such as Prague and Salzburg to enjoy the Christmas markets. But there are plenty of traditional Christmas markets closer to home in the UK in cities such as York and Edinburgh. Many cities and town across the UK play host to their own Christmas markets. Some do make that extra effort at Christmas, and markets in historic towns such as Edinburgh and Lincoln come with magnificent backdrops. Christmas markets provide the perfect location to get into the festive spirit. Buying gifts, listening to the carollers and browsing the many stalls offering food and drink is all part of the fun. With many cities holding their markets towards the end of November it’s never too early to enjoy the festivities. There are many excellent Christmas markets held in London each year and the Angels Market in Hyde Park is one of the best. The market is held from 19th November until 4th of January and features the best arts and crafts from around the globe. The giant illuminated Ferris wheel makes a great backdrop and there are over 100 stalls selling hand made toys, jewellery and glass ornaments. Hyde Park’s Winter Wonderland market has been running for over four years and is popular place to spend a few hours and enjoy the festive atmosphere. With the illuminated Edinburgh Castle in the background and the giant big wheel and fun fair rides, the Edinburgh Christmas market is one of the most popular in the UK. Edinburgh’s yuletide festivities attract 120,000 visitors from around the world each year to the Scottish capital. The market has a German theme so expect plenty of Frankfurt sausages and German beer. Edinburgh’s Real Scottish Christmas Fair lasts from 4th to 9th December but a programme of events runs for the entire month. Don’t miss the Grand Fantastical Christmas Parade on the 1st of December. York is well regarded as one of Britain’s most picturesque cities and does become a winter wonderland during December. With its stunning Christmas tree, stall owners dressed in Victorian costumes and carol singers there is no excuse not to be swept away with the Christmas spirit. The Barley Hall Medieval market and the St Nicolas Parliament Street market provide ample shopping opportunities for some mulled wine and traditional Yorkshire food. The St Nicholas Fayre starts on 25th November for four days and is definitely one of the most popular British Christmas markets. Now running for over 20 years the Lincoln Christmas market is one of the biggest in Europe. Featuring the floodlit 12th century Lincoln Cathedral as its backdrop and offering over 300 stalls in the cobbled square, it is one of Britain’s most atmospheric markets. Hundreds of thousands of visitors visit the Lincoln Christmas market each year to enjoy the mulled wine, traditional carollers and brass bands. 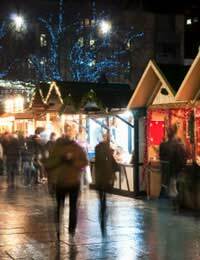 For a Christmas market with a magical atmosphere head to Lincoln between the 2nd and 5th of December. For a Christmas market with a difference head to historic Portsmouth. Set in Portsmouth’s dockyard, home to famous ships such as the HMS Victory, the Christmas market runs from 28th November until the 1st December. Join the stall holders dressed in Victorian costumes, explore the bazaar and visit the Victorian Santa in his grotto onboard the 1860 battleship the HMS Warrior. Wander down a Victorian street and enjoy carollers singing and stop off for a drink at a real Victorian tavern. Belfast is not only one of Ireland’s most famous tourist locations but also plays host to one of the best Christmas markets. Every year from the 20th November until 19th of December the City Hall gardens transforms into an Alpine Village. The Continental Christmas market is located in the middle of Belfast and provides shopping opportunities from 28 different countries. The illuminated big wheel and the City Halls provide the scenic backdrop to this stunning market. Traders come from as far as Russia, USA, Finland and Peru. Cardiff’s Christmas market has been an annual event for nearly two decades with the magnificent Cardiff Castle providing the scenic backdrop. Victorian arcades, vintage shops and specialist delicatessens are all part of the yuletide fun. The market takes place over two different areas in the city and runs from the 10th of November until the 23rd of December. Boasting every festive stall imaginable this is definitely one of the best Christmas markets in Wales.